Iñigo Cañedo is an designer from Mexico who specialises in Design, 3D Modeling & Print. 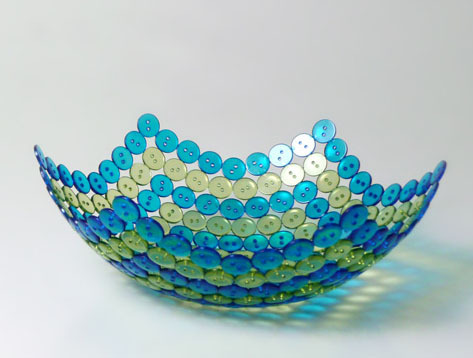 of the buttons creates light projections over the surface of the bowl and its surrounds. Thanks for blogging my bowl. It's nice to see your work around the web. Love this art piece. How did you ensure the glue would not stick to your spherical mold? This bowl is just amazing. I wonder just how hard this would be to do this! What kind of glue would be used to do this? does anyone know what type of glue to use? I would almost try a clear craft glue for the buttons on the balloon. I would like to know what type of glue as well, but that would be my guess. would imagine that he used a 2-part epoxy glue to glue the buttons together as I have found this to be the best glue to use on plastic. It must have taken a very long time, as there is very little trace of the glue in his photos and it can be a very tricky (and messy at times!) glue to work with. You could always get in touch with him via his website to ask - he was the first person to leave a comment! Does anyone know what glue it was? I tried the epoxy but it turned the buttons a yellow tint. But how long did it last? LOVE IT - I just emailed him - will post the type of glue when I hear back. My kids and I did this! Believe it or not we used Elmer's School Glue!! It dries clear. First we applied a VERY THIN layer to the balloon, stuck the buttons on the balloon, and allowed it to dry overnight. Then I took a sponge brush and applied an outer coat of glue to the buttons while still on the balloon. Allowed it to dry for 24 hours and then released the air from the balloon. Very fun to do with the kids :-) ENJOY! Is your bowl still looking nice? Wanted to try with Elmer's glue. Also, you just released the air from the balloon, didn't the remnants of the balloon remain? Beautiful and clever. BTW, I just followed your blog. Ruth did you ever find out what glue he used? Try hodgepodge? I'm not sure if I spelled that right. But I would imagine it would work. I'm wondering the same too -- does the balloon just peel off or is it stuck and difficult to remove? I would like to know, also, how well the balloon peels off. I just tried this for the second time... First I used elmer's glue and it did not work. Half of the bowl crumbled. Second time I tried mod podge puzzle glue, then I sprayed mod podge clear acrylic sealer. I still have not popped the balloon because it feels like it will crumble it is not hardening. Anyone have any ideas for glue??? wow Beautiful..I think I should try this. he might have sprayed the balloon with some kind of cooking spray? or maybe not...I have some 6000 glue I use with crafts I got it at JoAnn Fabrics. He might not tell us what he uses since this is his art. I agree, I think the balloon would need some type of lubricant to create a "non-stick" surface. So glad to hear you can do this one with Elmer's glue successfully as my kids have 2 large bags of buttons laying around from another project that I've been trying to find a way to use up. I love this one, and they can make something new for their rooms :) awesome idea, thanks for sharing! That said, balloons are not the only spheroid fish in the sea. You could put any release agent you wanted on plastic play balls. Just place the ball in a bowl to make it stable. Maybe drape it with plastic wrap? Interesting reverse concept, Perri! I'm going to try it your way. Since we live in Egypt, things that are seemingly simple like balloons that don't pop immediately and Elmer's glue are not easy to come by. But I've got a plethora of bowls and I'm going to try it with an epoxy type glue. Also keep in mind that he's an artist and may have access to a kiln. I would do this with a sheet of glass all the time-make a sand/bentonite mold in the kiln and let it melt over the mold. It would just take a lower temp and shorter fire with a ceramic bowl, but it could probably be done in an oven at a low temp. Melt them together! We did this but we used decorative glass beads instead and it turned out great! It also cost much less but we had to use glass adhering glue. I tried doing one with plastic wrap as a release agent - it stuck quite a lot to the buttons. Any tips for getting it to release? Thats the problem with blog comments, there is barely any conversation. It is hard to get answers to questions. It is not very interactive way to communicate. I am aware of this on my own blog and am considering a change. If you coat the balloon with just a layer of glue first and let it dry, it works rather well. I used Elmer's glue, and it worked like a charm. I let a layer of glue dry first on the balloon, then coated it a second time (after about 4 hours) then I added the buttons. After letting them dry I used 2 coats of glue for the top layer to strengthen it. As long as you use the first layer of glue on the balloon before you add the buttons to it, it doesn't stick once you release the air :) Good luck! Thanks for the idea. I am going to use mod podge and will let you guys know how it turned out. Thanks Jeannie. I am going to try your idea. Going to use mod podge and will let you guys know how it turned out. The best advice I can give for this bowl without ending up on Pinterest Fail's is to first cover your balloon in something to make it sturdy. I used brightly colored scraps of fabric and covered the ballon with modge podge and fabric. Then another coat of modge podge to seal it. This creates a "base" for the buttons to adhere to. 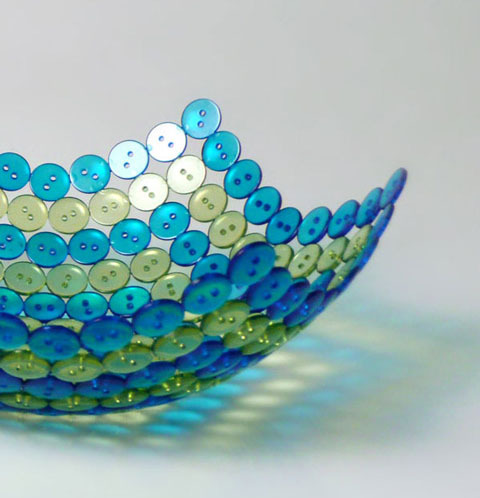 Not only that, but it also lines the bowl with fabric to match the buttons! Making it practical as well as functional! Happy crafting! I have tried this with 3 different glues and the balloon ALWAYS pops. so i would suggest not getting your kids excited cause it just breaks their little hearts when that balloon pops. I wonder if, once complete, you could put Mod Podge on the outside to help it hold form. I didn't read ALL the comments - anyone tried this? I'm thinking I will soon. tacky glue, a steady hand and patience!!! How does the buttons come off the ballon? I would use an old disposable bowl. Use a think layer of Vaseline and coat the buttons on with Marine Varnish. I have made 4 bowls like this so far. And I'm still trying to figure out how to make the bowl more stable. I've used ModPodge as the glue and it works fine to secure everything but after many, many applications the bowls still are not firm. In answer to some of the questions - Do not use a lubricant on the balloon or your glue and buttons will fall off. When you pop the balloon it should pull away from the buttons without any of it remaining attached to the buttons. BUT you must let it dry sufficiently. And that depends on how much glue you have used. One of my bowls took 4 days to dry. On one of them I popped the balloon too soon and immediately saw it start to cave in so inserted a new balloon and blew it up to the original size. I'm thinking in giving it a try. I know that some artists in Mexico work with "engrudo" for paper mache- flour paste- maybe this can help to harden the buttons and make them stay in place. Hope the balloon doesn't pop out. You'll find me here more than anywhere!